HONG KONG, May 9, 2017 - (ACN Newswire) - YPO, the premier chief executive leadership organisation in the world, reported today that confidence among business leaders in Asia rose in the first quarter of 2017 (Q1 2017), reaching a two-year high. The YPO Global Pulse Confidence Index for Asia increased for the second consecutive quarter, gaining 2.1 points to 63.3.
Business leaders in Asia reported a more cautious outlook than their counterparts in the United States but were more optimistic than chief executives in the European Union (EU). Having fallen behind in the fourth quarter of 2016 (4Q 2016), Asia once again came in ahead of the Index's global composite score of 62.5. Whilst the overall regional picture was significantly improved, there were marked differences in sentiment across the major economies in the region. India reported a more positive outlook, gaining 3.2 points to 66.0, reversing the dip it experienced in Q4 2016. India remains the most confident of any of the world's top ten economies. Sentiment amongst business leaders in China remained relatively flat, edging up 0.3 point to 61.6. However, Japan reported a more subdued outlook, slipping 2.6 points to 55.7, following a decrease in consumer spending in the first three months of the year. For the second consecutive quarter, economic sentiment amongst the emerging economies in Asia saw a healthy improvement, as global commodity prices continued to rebound. On the back of a 9.0-point surge in the final quarter of last year, the YPO Global Pulse Index for Association of Southeast Asian Nations (ASEAN) countries rose 4.0 points to land at 66.0, its highest level since July 2014. Most notably, Malaysia and Singapore reported significantly more positive outlooks. "It's positive to see that business leaders in Asia remain optimistic about the economic climate and the potential for growth, despite uncertainty surrounding the stability of the global economy, and the potential impact of more protectionist U.S. economic policies," said YPO member Wei Chen, Founder and Chairman of Sun Capital. "Of course, chief executives will continue to monitor economic indicators and the socio-political events unfolding within the region and beyond, but they will definitely believe that they can take advantage of these current economic conditions." 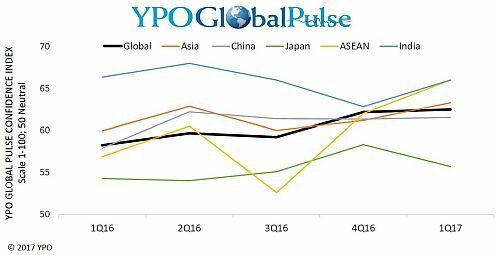 Globally, the YPO Global Pulse Index edged up 0.3 point to 62.5 during the quarter, its highest level since January 2015. For the second consecutive quarter, the United States reported the highest level of confidence in the world, inching up 0.3 point to 64.9. Confidence in the European Union (EU) remained flat at 60.9, while Africa is the second-least confident region globally, edging down 0.3 point to 54.4. Elsewhere, confidence in Latin America dropped by 1.2 points to 57.1, while confidence in the Middle East and North Africa (MENA) region showed the biggest decline, sliding 4.3 points to 55.2. Non-EU Europe reported the lowest level of confidence in the world, falling 2.5 points to 51.8.
Business leaders in Asia were optimistic about short-term economic conditions. The majority (55%) predicted that the economic landscape would improve over the next six months, while only 12% felt that the climate for business would deteriorate. The YPO Sales Confidence Index for Asia climbed 3.4 points to 70.3 in 1Q 2017. Almost three-quarters (70%) of chief executives expected to increase turnover in the next 12 months, while only 7% predicted a decline in revenue. When it came to hiring, the YPO Employment Confidence Index edged up 1.5 points to 58.3, its highest level since July 2015. A significant 40% of business leaders expected to increase headcount over the next year, whilst only 8% predicted a decline in staff numbers. The majority (52%) reported that the size of their workforce would remain flat. Finally, the YPO Fixed Investment Confidence Index slipped 1.0 point to 63.2. Despite the marginal drop, this was the highest confidence level of any region in the world. More than half (51%) of respondents expected to increase levels of fixed investment in the next 12 months, compared with only 4% who predicted reduced investment. The YPO Global Pulse Confidence Index for Australasia edged up 0.4 point to 63.4 in the first quarter, reaching its highest level since October 2010. Chief executives in Australasia were extremely upbeat about the immediate prospects for their own organisations. Optimism pushed the region's YPO Sales Confidence Index up 1.1 points to 73.8, its highest level in the seven-year history of the survey. More than three quarters (77%) expected to increase turnover in the next year, compared to only 2% who expected revenues to decline. Following the upturn, the YPO Employment Confidence Index rose 1.5 points to 61.2, while the YPO Fixed Investment Confidence Index slipped 2.2 points to 61.3.
Business leaders in Australasia were slightly more cautious about the economic and business climate over the next six months. Only 38% of respondents stated that they expected economic conditions to improve. This was down from 4Q 2016's survey, where almost half (47%) predicted an improved economic landscape over the following six months. For the quarter under review, 44% of chief executives believed that conditions would remain unchanged, while 18% predicted that the economic environment would get worse. The quarterly electronic survey, conducted in the first two weeks of April 2017, gathered answers from 1,216 YPO chief executive officers across the globe, including 153 in Asia and 60 in Australasia. Visit http://www.ypo.org/globalpulse/ for more information about the survey methodology and results from around the world.